LEXINGTON, KY. (March 5, 2019) — University of Kentucky Transportation Services is relocating an existing bus stop on Cooper Drive around the corner to University Drive. While the bus stop will physically only move approximately 100 feet, the change will dramatically improve access to the Kroger Field Red Lot and the College of Agriculture, Food and Environment facilities south of Cooper Drive. Previously, campus transit only served this area via the White Route. 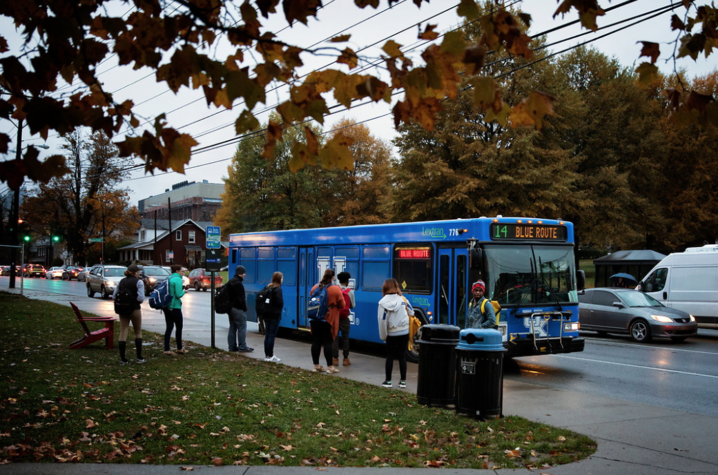 However, shifting the bus stop around the corner to University Drive now facilitates transit service from both the Blue and White campus routes, as well as the Sunday Yellow Route service. This improvement will have the largest impact on students living on campus in south and central campus residence halls who park in the Red Lot. These students can now ride the Blue and Yellow routes south along University Drive, disembark at the new bus stop and simply cross University Drive at the Cooper Drive intersection to access the Red Lot. Transportation Services is pleased to announce this change, which is a direct result of discussions generated between Transportation Services and the Student Government Association (SGA) following the SGA-led fall campus safety walk. In the coming months, Transportation Services will evaluate the possibility of adding a similar bus stop directly across University Drive adjacent to the Red Lot in order to mirror this same access for students parking in the Red Lot seeking transit service to main campus without having to backtrack to the Blue Lot bus shelter. For more information about UK Transportation Services, visit www.uky.edu/transportation and follow us on Twitter @UKParking.